The V-8 is great for power, but it is thirsty and it is not offered with all-wheel drive. For those reasons we recommend the still strong V-6. With its big footprint, big shoulders, and big V-8 power, the 2017 Chrysler 300 is an aging but charming sedan. The Chrysler 300 is a large sedan that straddles the line between the mass market and luxury. Big and bold, with rear-wheel drive and an available V-8, it is also quintessentially American, even though it's a distant, long-lost relative of a long-ago Mercedes E-Class. Available in 300 Limited, sporty 300S, and luxury-oriented 300C and 300C Platinum trim levels, Chrysler offers a 300 for most every taste. After a major refresh for the 2015 model year, the 2017 Chrysler 300 gets some updates to its infotainment system and adds three new option packages for the 300S model. Tech changes include upgraded processing power for the Uconnect system, with faster reactions, sharper graphics, Apple CarPlay and Android Auto compatibility, and the addition of pinch, tap, and swipe gesture controls. Interior and Exterior Sport Appearance packages are newly offered, as is a 300S Alloy Edition. 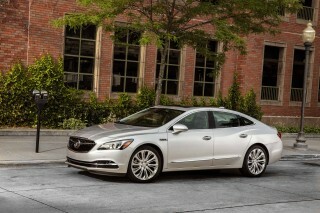 On the performance front, a 3.6-liter V-6 is easily up to the task of accelerating the large 300. With 292 horsepower on tap, the V-6 is strong, willing, and smooth, even when pushed. Opt for the 300S model and you’ll get a slight performance enhancement to 300 hp thanks to a cold-air intake. 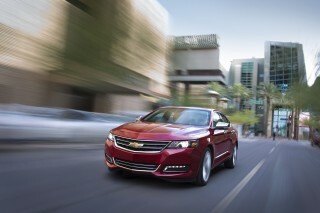 If you need even more horsepower, choosing the 5.7-liter V-8 (available in the 300S and 300C) pushes output to 363 hp. Together with the 8-speed transmission, the V-8 can scoot the large 300 to 60 mph in just 5.8 seconds. 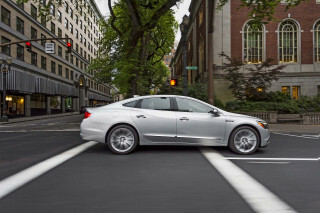 Rear-wheel drive is standard and all-wheel drive is optional for the V-6. Handling in the 300, 300S, and 300C is more about comfort and ride quality than performance. This is, after all, a large sedan. When the road turns twisty, you'll feel the 300’s size, though the standard electric power steering makes light work of taking turns. At the same time, the 300 is composed and well-sorted enough to cruise at a fair pace; just don't push it too hard. Chrysler offers a pair of “Sport” modes in the 300S and V-8-equipped 300C versions: one on the rotary gear selector, and another button on the dash. The “S” mode on the gear selector engages more aggressive accelerator behavior, engine response, transmission shifts, and a permanent paddle-shift mode. Pushing the “Sport” button on the dash adds sport-tuned steering effort, temporary paddle-shift mode, and the same engine, transmission, and pedal tweaks as the “S” mode. A host of safety features is available for the 2017 Chrysler 300, including forward collision warnings with automatic emergency braking, lane departure warning with lane-keep assist, adaptive cruise control, and emergency services call-assist using the vehicle’s data connection via the Uconnect Access system. With its older design, the 300 doesn't score all that well in crash tests. The 2017 model received four stars out of five overall for safety from the federal government. The IIHS gave the 2017 300 a good rating in all categories, except the small front-overlap test where it earned a "Marginal" score. 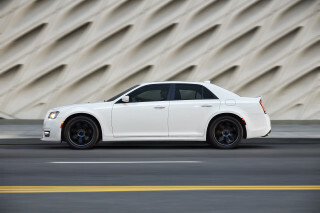 With the V-6, the Chrysler 300 earns EPA ratings of 19 mpg city, 30 highway, 23 combined. Adding all-wheel-drive lowers those numbers to 18/27/21 mpg. The thirstier V-8 penalizes mileage to 16/25/19 mpg. Upright and square-shouldered, the 2017 Chrysler 300 exudes American presence. The 300 has a decidedly American look, with a bold, upright design and a squared-off profile. It manages to exude swagger yet be buttoned-down and elegant. However, the look is aging, as the 300 has kept the same basic shape since it was introduced in 2005. Up front, the car features a large, simple, trapezoidal grille with a mesh pattern and the Chrysler winged logo inset at the top. LED fog lamps provide a consistent white color temperature at the front, and bi-xenon headlights are available for all but the base model. LED taillights with an illuminated halo provide a signature look at the rear, and a built-in lip spoiler helps square off the rear end. 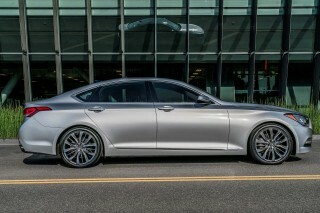 The profile is square-shouldered and brawny, yet sleek, and the 300S features unique side sills for a slightly more athletic appearance. The overall look changes based on model. The 300S model gets a black grille with a black chrome surround, black headlight bezels, and 20-inch Hyper Black wheels. The 300C features chrome for most of those bits, while the 300C Platinum has platinum-look trim pieces. Inside, the cabin’s look is all about smooth curves and organic shapes. Higher line models get nicer materials and even more style, with a two-tone leather upholstery finish available, as are hand-sanded, open-pore wood trim and metallic accents. At the base level, there are many black plastics, though. It's big and it may lean in turns, but the 2017 Chrysler 300 is stable and confident. There’s no doubting the 2017 Chrysler 300’s size is a big draw for both its appearance and its comfort. 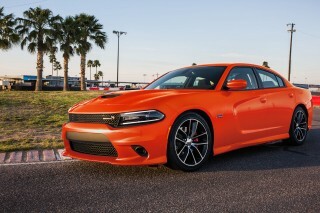 When it comes to performance, the size can get in the way of its ample power. 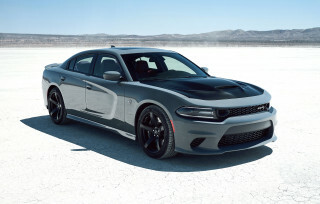 All models come standard with a 3.6-liter V-6 rated at 292 horsepower (or 300 hp in the 300S, thanks to a cold air intake and performance exhaust) as standard equipment. Although it’s not as powerful as the optional V-8 engine, the V-6 still hustles the large 300 along just fine. Whether accelerating onto the freeway or passing on a rural two-lane road, most buyers will find it plenty powerful for their needs. Opting for the 363-horsepower 5.7-liter V-8 engine turns up the power in a big way. Zero to 60 mph runs take just 5.8 seconds, and the power is delivered in a smooth, controlled manner befitting a car that leans toward luxury. A pair of “sport” modes also sharpens performance in the 300 range (available on 300S, 300C with V-8, and 300C Platinum). The “S” mode on the rotary shift selector engages sport-tuned engine, transmission, throttle, and paddle-shift settings; the “Sport” button on the dash separately engages those same functions, but adds sport-tuned steering, as well as enabling rear-biased torque distribution for the AWD system. The Sport modes cut shift times for the 8-speed automatic transmission down to just 250 milliseconds from the standard 400 milliseconds. The 300's big-car feel can be charming, including the body roll and soft heaving motions during acceleration and braking. For the 300 Limited and 300C, including the 300C Platinum, these descriptions are accurate—but not accusations. The 300 drives like a big American sedan should: stably and confidently—it just doesn’t handle like a sports car. While rear-wheel drive is the standard for the Chrysler 300 line, all-wheel drive (AWD) is available for V-6 models. The AWD system offers a complete axle-disconnect system to reduce parasitic drag and friction losses when the extra traction isn’t needed for power delivery. Refined, luxurious and roomy, the 2017 Chrysler 300's take on American luxury is quite appealing. The 2017 Chrysler 300 is a quiet, comfortable, well-constructed car with just enough engine, road, and wind noise to keep you connected with the road. The seats are suited to American tastes: they’re large, supportive, and, for front seat passengers, highly adjustable. Head room and leg room are also great in the front row. Rear-seat passengers will find the seats comfy, but taller occupants may come up a touch short on leg room. The interior of the 300 looks high-tech and it's also quite well assembled, with good fit and nice materials finishes throughout—aside from the occasional expanse of hard, hollow plastic in lower-trim models. The rubberized material of the dash looks and feels pleasant, though we have noticed it has a tendency to attract and collect lint as a result of its slightly gummy feel. Cupholders are, as you’d expect of a large American sedan, plentiful and well-sized. Elsewhere in the cabin there’s plenty of space for your stuff, including a bin ahead of the rotary shifter, molded-in bottleholders in the doors, and a 16.3-cubic-foot trunk. The 2017 Chrysler 300 gets middling crash-test scores, but it offers plenty of active safety features. Based on an aging platform, the Chrysler 300 doesn't perform as well in crash tests as newer cars. 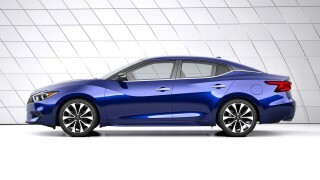 The 2017 model received four stars overall (out of five) from federal testers. In IIHS testing, the 300 received the top rating of “Good” in all tests except the small-overlap front crash test, in which it scored only a "Marginal" rating. Standard safety equipment on the 2017 Chrysler 300 includes a rearview camera, a driver's knee airbag, curtain side airbags, front side airbags, hill-start assist, and rain brake assist to help dry the brakes in wet conditions. On higher trims, you can get an option package that includes forward-collision warnings with automatic emergency braking, adaptive cruise control, lane departure warning with lane-keep assist, blind-spot monitors, rear cross-traffic alerts, rain-sensing wipers, and automatic high beams. An available Uconnect Access system can directly connect the vehicle’s occupants with emergency services with a single button press, using the car’s existing data connection. Vision in the Chrysler 300 is quite good in all directions, thanks to narrow roof supports. The 2017 Chrysler 300 keeps up with Apple CarPlay and Android Auto. The 2017 Chrysler 300 is offered in a range of trims, allowing buyers to equip their cars for luxury, sportiness, technology, or a combination of the three. The lineup includes the well-equipped, entry-level 300 Limited, the sporty 300S, the luxury-oriented 300C, and the high-tech loaded 300C Platinum. Starting with the 300 Limited, standard features include power features; heated, power-adjustable front seats; leather seating; a heated tilt/telescoping steering wheel; dual-zone automatic climate control; keyless ignition; and 18-inch alloy wheels. The base infotainment system in the 300 is the Uconnect 8.4 system, which includes an 8.4-inch touchscreen, a rearview camera, an AM/FM radio with six speakers, Apple CarPlay and Android Auto compatibility, satellite radio, two USB ports, Bluetooth phone and audio streaming, voice control, and an auxiliary input jack. The icons on this screen are large enough to be easy to hit with a finger, and strong processing power means quick reactions. The design is as easy to understand as anything on the market, making this one of our favorite in-car control systems. The sport-tuned 300S adds a sport suspension on V-6 models, or a performance-tuned suspension with the V-8 that includes increased spring rates, performance-tuned steering and bushings, larger sway bars, and 20-inch Goodyear Eagle F1 summer tires. The performance suspension, steering, and Eagle F1 tires are also offered for the rear-drive V-6, but it doesn't come with the larger sway bars. All 300S models also have shift paddles, a sport mode for the transmission, piano-black trim, blacked-out exterior trim, remote starting, and a 552-watt Beats audio system. The 300C aims for greater luxury, with premium leather; ventilated front seats; natural wood trim; electrically adjustable pedals; navigation; memory for the driver's seat, mirrors, steering wheel, pedals, and radio; a sunroof; heated rear seats; and a 276-watt audio system. The 300C Platinum takes the luxury a notch higher with perforated and quilted leather upholstery; hand-sanded open-pore wood; adaptive and auto-leveling bi-xenon headlights; a 900-watt 19-speaker Harman Kardon audio system; and unique satin-finish “platinum chrome” 20-inch alloy wheels A Poltrona Frau leather-wrapped instrument panel is optional for the 300C Platinum. New for 2017 are Exterior and Interior Sport Appearance packages. The Exterior package is standard on the 300S V-8 model and optional for the 300S V-6. It comes with a more aggressive front fascia, unique LED fog lamps, sculpted side sills, and a deck-lid spoiler. The Interior package adds premium perforated leather performance seats with high-bolstered contours in suede. Also new is a 300S Alloy Edition. It adds unique floor mats, grille and surround; liquid Titanium Chrome wing badge; Alloy Edition badging; titanium exhaust tips; its own wheel design; piano black and titanium interior accents; and black and caramel leather seats with an S embroidery on the front seats. The V-6 versions are efficient for a large car, but the V-8 models are somewhat hard on gas. The 2017 Chrysler 300's weight and size is somewhat offset by the efficient V-6 engine and the standard 8-speed automatic transmission. The V-8, however, is relatively hard on gas. 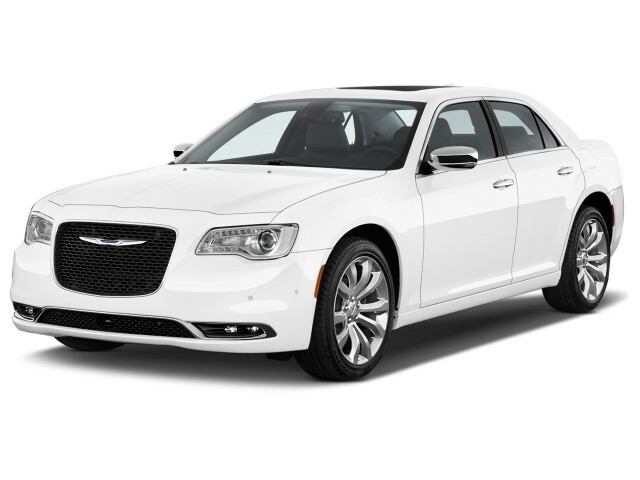 With the V-6, the Chrysler 300 earns EPA ratings of 19 mpg city, 30 highway, 23 combined. Adding all-wheel-drive lowers those numbers to 18/27/21 mpg. 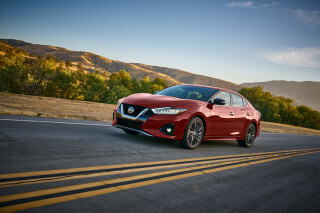 Only about 15 percent of buyers opt for the V-8, which comes only with rear-wheel drive and offers EPA fuel economy ratings of 16/25/19 mpg.